This first role-playing article on the EOG looks at the ‘OSR’—the revival of interest in 1970s/80s styles of role-playing, especially original and basic D&D (folks, computer games are not role-playing games). We’re not that interested in modern role-playing games here at the EOG, with their complicated rules and emphasis on powering up characters. We’d much rather just have a good laugh and kill some monsters, really. If you, like me, spent a good chunk of your formative years pitting your friends against horrific monsters, sending them into dank dungeons, inflicting damage, disease and insanity upon them, and generally acting like God on (Middle-) Earth, then I hope you too were playing Dungeons & Dragons and aren’t instead a psychopath now paying for your terrible crimes. A lot of people born in the sixties and seventies were doing the same, or the targets of such trevails as adventuring characters in a fantasy, sci-fi or historical world. D&D, and the many role-playing games it spawned, were a big fad of the late 70s and 80s; but a fad with a far bigger impact on people’s lives than twirling a hula–hoop or spinning a yo-yo. There’s been nothing quite like that early craze for role-playing games, before or since, and anyone who spent any serious time playing them at the time will understand what I mean. Now I’m really, really late to the party (this whole thing kicked off about five years ago), but something called the OSR (‘Old School Renaissance’) has been in full swing for a while now. Actually, in a way I was a bit of a pioneer personally and professionally in this respect, because I went through a D&D nostalgia trip about ten years ago, when I re-bought the old books and adventure modules on Ebay that I’d so foolishly sold in my late 20s, thinking “I’ll never play that stuff again.” And if I may present my other credential, I created the website The World of Tékumel back in 1997 to celebrate the first RPG I ever played: Professor M.A.R. Barker’s The Empire of the Petal Throne. That’s about as old school as you can get. Like most things that are an integral part of one’s formative years, D&D has a magic about it that never really goes away. My friends and moved on to Warhammer Fantasy Roleplay, a RPG set in the Empire of the Warhammer universe, in about 1987—but games of original D&D have a special atmosphere that the proponents of the OSR love to celebrate. We’re not talking about anything published ‘officially’ during the last couple of decades of increasing commercialisation and steadily encroaching blandness, of bad movies and cartoons and licenced toys, or of versions 2, 3, 3.5 (argh! ), 4, and what is currently called D&D Next (triple argh!). We’re talking about three very early systems—the original ‘white box’ rules (just before my time), the old Basic Dungeons & Dragons sets (the original by J. Eric Holmes is where I came in—you can see the rulebook cover on the right), and the first edition Advanced Dungeons & Dragons hardcovers (AD&D—the system I played the most). 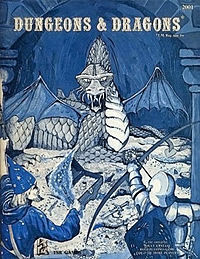 We’re talking everything up to about 1984, when the Dragonlance adventure modules came out and the original pulp science-fantasy origins of D&D began to be replaced by a kind of bland ‘American Tolkien’ fantasy melieu of buffed heroes, chainmail bikinis and Big Bad Guys. No, we’re talking getting a fighter, magic-user, cleric and thief together and descending into some monster-infested dungeon in search of gold pieces and magic items. A lot of other people remember these good old days before Hasbro bought everything in sight, and hence the OSR has flourished on scores of blogs across the internet. And small (one-personal small) publishers responded. There are now myriad cheap PDF rules sets and adventure modules taking you back to the days when fun was more important than plots, players—instead of their skill scores—decided what their character did, miniatures were pretty much non-essential but graph paper was, and characters died a lot (and were resurrected). Some of the best-known are Labyrinth Lord, a Basic D&D ‘retro-clone’ with a some companion rules to bring it up to AD&D style; Swords & Wizardry, which keeps things nice and simple and is modelled after OD&D (‘Original D&D’); and OSRIC, an AD&D retro-clone. Other game systems of the period are getting their time in the sun too: Mutant Future (modelled on the old post-apocalyptic RPG Gamma World), Stars Without Number and Thousand Suns (Traveller)—the list goes on and on. But my absolute favourite is a system called Dungeon Crawl Classics Role Playing Game (DCC RPG for short). This system is more D&D-inspired than D&D-clone, and after several sessions with my new gaming group here in New Zealand, it’s proving to be one of the most enjoyable RPGs I’ve ever played. With an emphasis on ‘letting the dice roll where they may’, classic dungeon delving, hilariously random spell tables, critical hits and fumbles, and an ingenious system called ‘the funnel’ where players start their adventuring with about four 0-level peasants (most of whom tend to die horribly before too much time has passed), DCC RPG is a hoot. 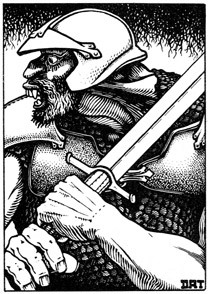 The defining visuals of the OSR are the original illustrators, many of whom are enjoying their own personal resurgence in popularity. Old school artists like Jim Roslof and David C. Sutherland (both, sadly, recently passed away), Russ Nicholson, David Trampier (a personal favourite—that’s his wonderfully graphic work on the left), Erol Otus, Jeff Easley, Jim Holloway and others are finding their somewhat naive but hugely evocative styles once more in vogue. OSR gamers are sick of the lifeless, ‘realistic’ perfection that passes for game art these days, and enjoy this old style of art that is so full of personal style and character. The Dungeon Crawl Classics Role Playing Game, in particular, features an impressive roll-call of these classic artists, who quite literally defined the imaginative worlds of a generation of gamers. Even back then as a kid, I knew who these guys were and recognised each of their styles—who could say the same about most of the generic art pumped out by big game companies these days? But there’s no future in wallowing in nostalgia, and those enamoured of the OSR, while understandably enjoying revisiting the vivid fantasies of childhood, are also looking to the future. New games are coming out that marry old approaches to gaming to simpler mechanics—for example the aforementioned DCC RPG. The idea is to tear role-playing back out of the grasp of corporations and companies that want gamers to stay within the boundaries of the worlds they market and sell. Not to mention making role-playing games playable again for those of us with families, mortgages and a frightening dearth of the endless spare time we had as teenagers. Role-playing used to be about freedom to imagine anything. Care for a bit of science-fiction mixed in with your fantasy? Go for it. Don’t like the game worlds the companies have invented? Invent your own. Things in your imagination are inconsistent and ‘unrealistic’? Who cares! The important thing is to not worry about the rules so much: make it up as you go along, make a ruling on the spot, roll a dice on a table of random results. For someone like me, who has long been obsessed with preparing games long past the point of necessary effort, it’s a liberating return to the original goals of getting a few people together and making up stories in your collective imagination. So if you’re getting a bit sick of the rules and restrictions, give the OSR a try. One of the great advantages to playing in 2013 rather than 1978 is that you can play via the internet using video conferencing technoogy. Recently my old Australian gaming group and I had a hilarious session of DCC RPG via Skype. They all gathered around a table in Sydney with a computer screen at one end, where I game-mastered the game from Nelson, NZ, looking like Max Headroom in all his glory. It worked astonishingly well. What better way to bring old friends together than an afternoon of guts, glory and gold? For me, it was the Redbox (BECMI) edition of the re-organized Moldvay(?) edition. I’ve picked up the Rules Cyclopedia(released in 90-91) which was a culmination of all the previous “Basic” DnD Rules sets. (These can be picked up in PDF form at DnDClassics.com). And we played our first “Basic” DnD game in over 20 years and it was a blast! We are including a couple of children to our next session so they can learn what it means to role play the imagination, not what’s served to you on the screen! Labrynth Lord is the (free) Retroclone of this rule set. OSRIC (i believe) is the ADnD Retroclone. Sadly, Dave Trampier passed away recently. R.I.P. It’s a very fun game, though you have to be prepared to lose a few characters along the way as the game tends to revel in killing them off! Does your old Sysney group still exist and would they like to play some more DCC? We haven’t had a chance to play anything for a couple of years now – busy lives! That’s unfortunate. I’m traveling to Sydney the first week of September and was hoping to find a DCC game to drop in on.